Ozone delivered the biggest upset of the tournament. The silence hung heavy around Seattle Riot after their 12-11 loss to Atlanta Ozone in the quarterfinals on Friday afternoon. Tears streamed through eye black. Teammates held each other needfully, while mere feet away Ozone players leapt into each other’s arms with the utter joy and slight incredulity of a true underdog. For the first time in 17 years, Seattle Riot won’t be cleated up for a semifinal game. The story that has long defined Riot was their quest for gold. Nobody imagined that the tournament’s no. 1 seed would falter in the quarterfinals. The defending WUCC champions wouldn’t even qualify for the 2018 tournament. Riot was poised in every way to succeed this season. They arrived in Sarasota as the no. 1 seed after a nearly perfect season that included wins against the rest of the “Big Four.” They had a 13-10 win already over Ozone from Pro-Elite Challenge. Every game counts, but it’s hard not to wonder if their sights were set deeper in the bracket. Seattle Riot was summarily dethroned by two opponents today: Atlanta Ozone and the gusting Florida wind. 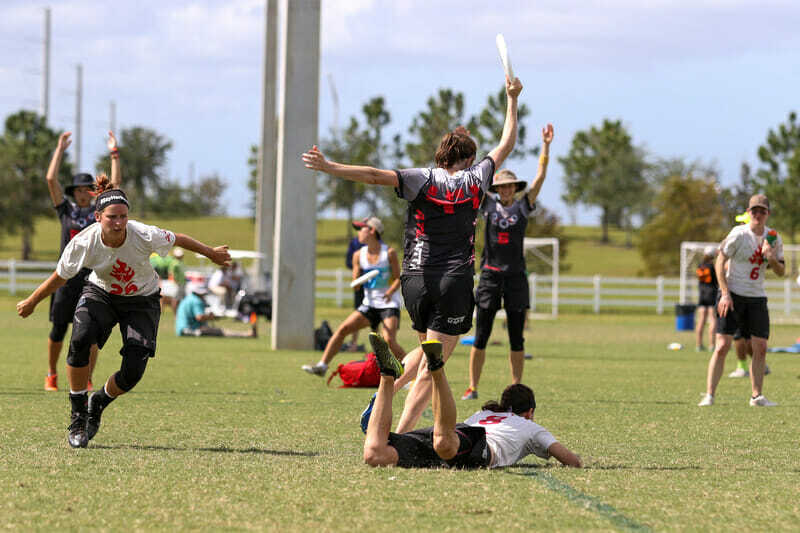 Ozone had an affinity for long ball ultimate before this season, but the addition of Callahan winner Paula Seville (Brute Squad) and Kate Travaglini (Phoenix) this season made both sides of their offense more powerful. Seville, India Stubbs, and Cate Woodhurst made plays happen from anywhere on the field and at any stall, and Ozone’s Emily Lloyd, Mira Walker, and Marissa Hicks had unbelievably sticky hands. The notorious Sarasota wind also stymied Riot’s system. Riot’s handlers are renowned for their grass-brushing breaks, but in Friday’s wind, several throws floated out of control or petered out into the grass. Ozone had already won in the wind in prequarters, and their throwers were conscious of never giving up the short field. The beginning of the game exists in a simpler time, when seeding made sense. Riot broke upwind to open the game. Qxhna Titcomb and Kelly Johnson handled with the confidence and poise that has made them household names. Despite a few focus errors — a fumbled pass, throws into coverage — Riot sealed their break downwind and built a tidy 3-1 lead. Then the trouble began. Ozone got the better side of a long, turn-heavy point to break. D-line handlers Katherine Wooten and Sophie Darch marched their team toward the upwind endzone with easy arcing breaks until Wooten made a statement grab in traffic for their first break to tie the game. It was only 3-3, but that break changed the complexion of the game. Ozone knew how to use the wind, and they had the skill to run with Riot. Riot had only had two turnovers in the five points before Ozone’s break. In the next four points, they had five turnovers. Riot fumbled floaty passes, they dropped too-low reset passes, and they threw into crowded lanes. Ozone executed. They trapped Riot handlers on the windy sideline to force low, high-risk resets, and they shifted downfield to subtly influence Riot’s cutting patterns. “We knew that they love their insides, and they love attacking the middle, so we adjusted downfield to push their cutters to cut really wide, hoping that some of the throws would be longer and have more of a chance to pop up,” said Ozone captain Emily Lloyd. The adjustment worked. Riot’s cutters spent a lot of time toeing the windy sideline, and break backhands that should have curled into waiting hands sailed out of bounds instead. The wind kept taking from Riot and giving to Ozone. Atlanta’s offense wasn’t necessarily efficient, but when Wooten and Seville can crank out 60 yard bombs, Ozone either scores or Riot has to march up another full field. Another bout of Riot errors helped Ozone break again and build a four point lead. Riot faced the kind of deficit late in the game that they usually inflicted on their opponents. You could almost hear the clock ticking on the field as Riot rallied late to rattle off two breaks and close the margin. It wouldn’t be enough. At 12-10 with the soft cap in effect, Riot needed three breaks to win. Yet Riot couldn’t close. The hard cap blew as Riot tried to press their last chance at the bracket. Captain Shira Stern caught the final goal upwind from Kelly Johnson to break again. At first, both teams seemed unsure if it was the end. The observers gave the signal, and Ozone erupted. Riot collapsed. This was supposed to be their year to win it all, and they were finished. This game already seems like a turning point that will change future iterations of Riot. Comments on "Riot Fails To Qualify For Semifinals For First Time Since 2000"